We demonstrate a novel sparse 13C labelling approach for methylotrophic yeast P. pastoris expression system, towards solid-state NMR studies of eukaryotic membrane proteins. The labelling scheme was achieved by co-utilizing natural abundance methanol and specifically 13C labelled glycerol as carbon sources in the expression medium. This strategy improves the spectral resolution by 1.5 fold, displays site-specific labelling patterns, and has advantages for collecting long-range distance restraints for structure determination of large eukaryotic membrane proteins by solid-state NMR. The online version of this article (doi: 10.1007/s10858-016-0033-1) contains supplementary material, which is available to authorized users. 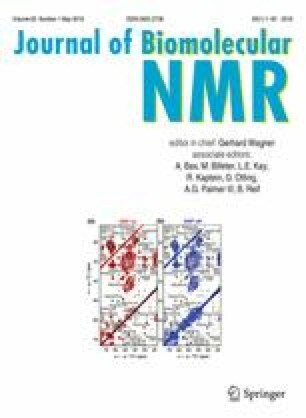 All NMR experiments were carried out at the Beijing NMR Center or the NMR Facility of the National Center for Protein Sciences at Peking University. This work was supported by the National Natural Science Foundation of China (31470727), by the Beijing National Laboratory for Molecular Sciences, and by the start-up funds from Peking University. S.W. is a recipient of the 1000 plan for young talent program of China. We thank National Center for Protein Sciences at Peking University in Beijing, China, for assistance with MALDI-MS experiments and Dr. Wen Zhou and Dr. Rong Meng for data collection.